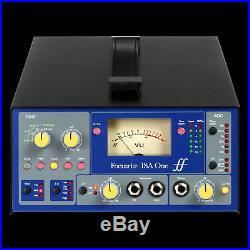 Focusrite ISA1 One Analog Microphone Preamp. The ISA One microphone preamplifier delivers Focusrite's prestigious ISA transformer-based preamp in a rugged and portable chassis, at a groundbreaking price. ISA One features the classic vintage microphone preamplifier topology from the original ISA110 module, which formed the cornerstone of each channel of Focusrite's legendary Forté console. The preamp is complemented by a line input and an independent D. Channel, complete with dedicated gain control, active or passive impedance switch, a TRS Jack output for routing to an amp and an independent XLR output on the rear. Makes the ISA One ideal both for engineers wishing to blend a D. D guitar signal with a mic'd guitar cabinet, and for demanding performers who require a single classic solution for both guitar and vocals. A variable impedance circuit has been added, allowing the user to switch between four carefully selected input impedance settings. In addition to the original ISA110 impedance, three further impedance settings allow perfect matching, or creative mismatching of the preamp with any microphone. ISA One also features an insert point, should the need arise to place extra processing between the preamp or D. Phantom power, phase reverse and a 75Hz, 18dB/octave high-pass filter are also available from the angled front fascia. Independent input metering for both channels is provided in the form of a moving coil VU meter with variable calibration to suit analogue and digital recording media, alongside two six-LED peak meters; inputs can be metered either pre- or post-insert. The meter calibrations utilise all the same reference points as Avid's Pro Tools HD system, allowing effortless line-up. An optional state-of-the-art stereo A-D converter is also available (the same card as used with the ISA430 MkII). NOTE: The ISA One Digital comes with the A-D converter as standard. Encased in a rugged and portable chassis, ISA One offers the classic Focusrite microphone preamplifier at its lowest cost to date. ISA One is ideal for both engineers and demanding performers alike, featuring independent gain control, an output for routing to an amp, an independent XLR output on the rear and routing to the optional A-D converter. Choose one of four carefully selected input impedances, including the original ISA110 setting, to suit any microphone. Headphone output with volume control. ISA One can feed either a sum of the two inputs to the headphones output, or an external stereo cue mix (such as a stereo mix feed from an interface) via two TRS Jack inputs on the rear of the unit. Allows you to place extra processing between the preamplifier or D. And the optional converter, such as an EQ or compressor. Optional stereo 192kHz A-D converter. You can choose to upgrade your unit with an optional digital card that delivers the best A-D performance in its class (dynamic range of 118dB). 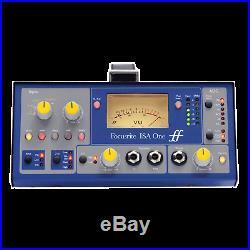 Alternatively, the ISA One Digital<=Link to ISA One Digital product page> comes with the A-D converter as standard. We always quote'real world' performance figures (measured to the AES17 standard). Some companies choose to quote chipset performance, which is misleading, and here's why. Gain range = 0dB to 60dB in 10dB steps + 20 dB of variable gain. Input Impedance, variable as follows. (Switched Impedance setting Equivalent Input Impedance at 1kHz). EIN (equivalent input noise) = -126dB measured at 60dB of gain with 150 Ohm terminating impedance and 22Hz/22kHz band-pass filter. Noise at main output with gain at unity (0dB) = -97dBu measured with a 22Hz/22kHz band-pass filter. Signal to noise ratio relative to max headroom (9dBu) = 106dB. THD at medium gain (30dB) = 0.0009% measured with a 1kHz -20dBu input signal and with a 22Hz/22kHz band-pass filter. Frequency response at minimum gain (0dB) = -0.5dB down at 10Hz and -3dB down at 125kHz. Frequency response at maximum gain (60dB) = -3dB down at 16Hz and -3dB down 118kHz. CMRR=98dB (Channel 1, 1kHz, maximum gain with +24 dBu input). Gain range = -20dB to +10dB in 10dB steps + 20 dB of variable gain. Noise at main output with gain at unity (0dB) = -96dBu measured with a 22Hz/22kHz band-pass filter. Signal to noise ratio relative to max headroom (24dBu)=120dB. Signal to noise ratio relative to 0dBFS (+22dBu) = 118dB\. THD at unity gain (0dB) = 0.001% measured with a 0dBu input signal and with a 22Hz/22kHz band-pass filter. Frequency Response at unity gain (0dB) = -0.3dB down at 10Hz and -3dB down at 200kHz. Frequency Response at 10dB gain with -10dB input = 10Hz-100kHz +/- 0.6dB. Frequency Response at 40dB gain with -40dB input = -2.5dB down at 10Hz and 0dB at 100kHz. Roll off = 18dB per octave 3 pole filter. Fixed Frequency 75Hz measured at the 3dB down point. Moving coil (MC) meter is factory calibrated to 0VU = +4dBu with 1kHz sinewave. With the VU Cal button pressed the meter can be adjusted on the rear panel to allow 0VU to equal +10dBu to +26dBu with the centre detent being equal to +22dBu. Peak LED meters calibrated in the detent position for 0dBFS = +22dBu, calibration is adjustable on the rear panel to allow 0dBFS to equal +10dBu to +26dBu. Routing for MC and Peak1 meter is after the HPF, pre insert send or switched post insert return. Peak2 is always pre ADC channel 2, which can be fed by external input or Instrument input. LED levels are as follows when peak calibration is set to center detent on the rear panel. (This is when using the internal ADC). Mic input: XLR x 1. Line input: XLR x 1 and TRS x1. Instrument input TRS Jack: XLR x 1. External ADC input: TRS Jack x 1. Return: TRS Jack x 1. Send: TRS Jack x 1. Balanced line output: XLR x 1. DI output: XLR x 1. DI through: TS Jack x 1. Cue mix left input: TRS Jack x 1. Cue mix right input: TRS Jack x 1. Headphones output: ¼ TRS Jack x 1. 220mm (W) x 104mm (H) x 254 - 290mm (D - top to bottom). 8.66" (W) x 4.1" (H) x 10" - 11.4" (D - top to bottom). Merchandise and packaging MUST be in the same condition as when received. Alto Music reserves the right to refuse any return if it appears the item has been used. Software (if unsealed or registered). Please do not send a message or call Alto Music in regards to best offers. If a specific listing of ours does not include the "make an offer" button, we are then currently not accepting anything less than the BIN price for that particular item. 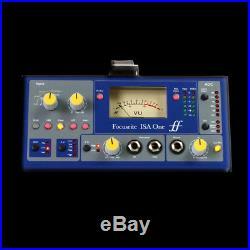 The item "Focusrite ISA1 One Analog Microphone Preamp" is in sale since Tuesday, August 22, 2017. This item is in the category "Musical Instruments & Gear\Pro Audio Equipment\Preamps & Channel Strips". The seller is "altomusicpro" and is located in Middletown, New York. This item can be shipped to United States, Canada, United Kingdom, Denmark, Romania, Slovakia, Bulgaria, Czech republic, Finland, Hungary, Latvia, Lithuania, Malta, Estonia, Australia, Greece, Portugal, Cyprus, Slovenia, Japan, China, Sweden, South Korea, Indonesia, Taiwan, Thailand, Belgium, France, Hong Kong, Ireland, Netherlands, Poland, Spain, Italy, Germany, Austria, Israel, Mexico, New Zealand, Philippines, Singapore, Switzerland, Norway, Saudi arabia, Ukraine, United arab emirates, Qatar, Kuwait, Bahrain, Croatia, Malaysia.